INDUSTRY.co.id - Beijing - ZTE introduces its newest unique smartphone named Axon M, this smartphone has two screens at once on the front and rear. Interestingly, if the folds are opened, then the two screens can align side by side. When viewed at a glance, Axon M is not much different from other smartphones on the market. This smartphone has two 5.2-inch screen sizes with 1080p Full-HD-coated Gorilla Glass 5, Snapdragon 821 chipset, 4GB RAM, and 12MP camera for each screen. Thanks to the hinges that are between the two screens, Axon M can be unfolded to reveal both screens. The two screens can be used in several needs. Quoted from The Verge, the user will be able to combine the two screens to display a larger view. In addition, multitasking features can be run to show two different views on each screen at the same time. This smartphone can be folded to resemble a tent shape that allows users to see the same content from different directions with colleagues. 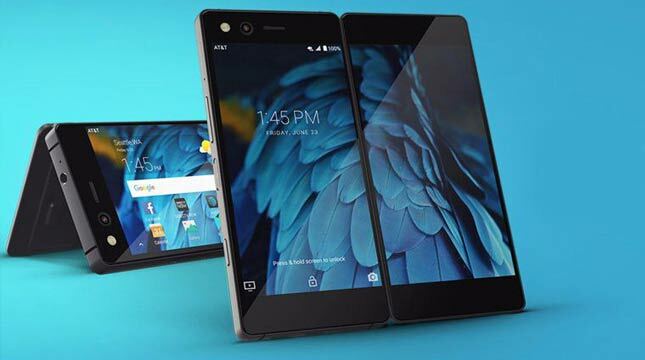 For this smartphone ZTE uses Android's default split-screen feature to deliver multiple-screen functions. A manufacturer from China is also claimed if their product is better than Kyocera Echo, two-screen smartphone that was released in 2011 ago. Although Axon M uses a battery with a capacity of 3180 mAh, but ZTE sure this new smartphone besutannya can be used throughout the day by using two screens at once in a single charge. They also say that using WiFi will save battery more than using cellular data for internet access. The smartphone, which has a thickness of 12.1 mm and a weight of 230 grams, went on sale globally on November 17, 2017 in partnership with AT & T in the US market and Docomo for the Japanese market. ZTE is also rumored to be marketing this new product in China and various European countries on the same date. Unfortunately, ZTE has not released the official price of Axon M.